Assurance that fridge product stays refrigerated! A Cool Cube™ at Fridge Temperatures is not an ordinary transport cooler (blood products carrier). It is an easy-to-carry, qualified container and pack-out system that keeps temperature sensitive product (various blood products) chilled between 1° and 10°C for nearly 3 days, or between 1° and 6°C for over 1.5 days– without using ice or electricity! This cooler is ideal for transport, but also excels at protecting valuable product during off-site use and power outages, regardless of hot or freezing conditions. The simplified, validated, patented technology is the best compact thermal protection product available to maintain the cold chain! Transport & Storage Coolers @ Fridge Temps for Blood Products, etc. 1. Place panels in a freezer so PCM (phase change material sealed inside the panel) is solid. Shake to verify. If a refrigerator maintains 4°C or below, the PCM within the panels will not melt (melting point is 4.5°C), keeping the PCM solid indefinitely until pack-out. If the refrigerator maintains 5°C or above, periodically check for melting and restart prep to ensure best performance. Before assembly, shake panels to verify PCM is solid. If liquid can be heard, panels may be used but hold times will decrease. 1. Store panels in a refrigerator for a minimum of 24 hours before use. Shake to check the state of PCM (phase change material inside the panel). If liquid…panel is at the fridge temp but above 5°C; anticipate shorter hold times. If solid…panel is at the fridge temp but below 4°C; ideal for maximum hold times. If solid/liquid combination…panel is at the fridge temp of 4-5°C; monitor time/temp. In a refrigerator that maintains 4°C or below, PCM will be solid (ideal for keeping product cold in warm/hot conditions). In a refrigerator that maintains 5°C or above, PCM will be liquid. Although panels are liquid, the PCM inside is at the temperature of storage environment after 3 hours (i.e. stored in a 6°C fridge, the PCM panels are at 6°C). Assembling the Cool Cube™ with liquid panels (additional thermal mass) will help keep product at their temperature, just for a shorter amount of time. Monitor Cool Cube™ temperature closely. 1. Store panels in a freezer so PCM (phase change material sealed inside the panel) is solid. Shake to verify. 2. Transfer panels into a room temperature environment just prior to use (recommended time below) to allow PCM inside to rise to the appropriate operating temperature. PCM panels coming out of a freezer into a room temperature environment may develop frost and/or condensate on the outside. After the frost turns to condensate, it is above 0°C. As soon as any liquid is heard inside the panel, it is at or above 4.5°C. 1. Place panels in a fridge between 5° and 8°C or at least 24 hours before use so PCM (phase change material sealed inside the panel) is liquid. Shake to verify. Panels may be stored in the fridge until needed for assembly or the PCM solidifies. If a refrigerator maintains 5°C or above, the PCM within the panels will not get solid (solidifying point is 4.5°C), keeping the PCM liquid indefinitely until pack-out. Liquid panels will protect the product from freezing until the PCM inside becomes completely solid. Before assembly, shake panels to estimate the state of the PCM. Liquid PCM panels will prevent product from freezing (at refrigerator temps) in extreme cold the longest. Slushy or solid PCM panels may be used but hold times will decrease. 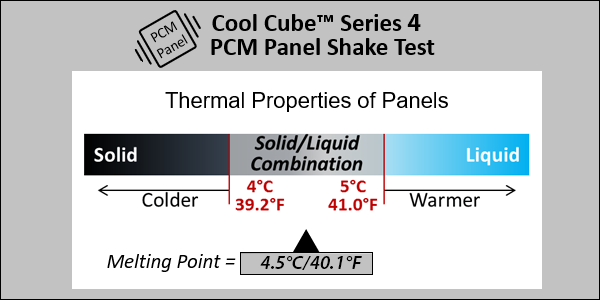 Cool Cube™ PCMs offer custom temperature holds based on their melting point. The PCM inside Series 4 panels has a melting point of 4.5°C/40.1°F. When panels are solid, contents within the Cool Cube™ stay cool (at fridge temps around 4.5°C) in hot conditions during an extended period of time. When panels have liquid inside, contents within the Cool Cube™ won’t freeze (again at fridge temps around 4.5°C) in extreme cold during an extended period of time. When the panels have reached 4.5°C and are completely solid, they are ready to hold your product. To verify that they are solid simply shake the panel. If you shake the panel and it feels and sounds slushy, with some liquid and some solid it will hold your product at a cool temperature, but it won’t hold it as long as if the panel is completely solid. If you shake the panel and it feels and sounds completely liquid, put the panel back into the freezer/refrigerator and continue to condition until the panel has reached a solid state. Shake a panel at various times to get to know your panels. For example, shake the panels when you know they are warm to hear and feel how they react when they are liquid. Within this webpage are several methods for conditioning your PCM panels. The standard conditioning method is performed in the refrigerator. The advantage of the refrigerator is that your panels won’t get too cold. This method can take from 8-24 hours. Alternatively, if you need to use your panels sooner than 8-24 hours, they can be conditioned in a freezer. PCM panels can be frozen too cold, but there is an easy solution when this occurs. When the panels are frozen to a point below 0°C/32°F, a short staging period is necessary to safely transport your product. If your panels have been stored in the freezer simply take the panels out of the freezer and lay them, individually (unstacked), on a flat surface at room temperature for roughly 30 minutes. Hold times of the PCM panels vary depending on Cool Cube™ size and desired holding temperature. For example, when properly packed-out into the Cool Cube™ 08, the Series 4 PCM panels can hold the cooler at a temperature below 8°C and above 2°C for 76 hours. With all pack-out procedures, be sure to use a temperature monitoring device to consistently and accurately monitor the temperature your payload for the entire time it is held in the Cool Cube™. Some regulatory bodies such as the CDC require the use of a certified data logger. VeriCor carries several types of thermometers and digital data loggers that meet the CDC recommended guidelines.